This image shows the Large Magellanic Cloud galaxy in infrared light as seen by the Herschel Space Observatory, a European Space Agency-led mission with important NASA contributions, and NASA's Spitzer Space Telescope. The image was taken Jan. 10, 2012. This space wallpaper shows the Large Magellanic Cloud galaxy in infrared light as seen by the Herschel Space Observatory, a European Space Agency-led mission with important NASA contributions, and NASA's Spitzer Space Telescope. In the instruments' combined data, this nearby dwarf galaxy looks like a fiery, circular explosion. Rather than fire, however, those ribbons are actually giant ripples of dust spanning tens or hundreds of light-years. Significant fields of star formation are noticeable in the center, just left of center and at right. 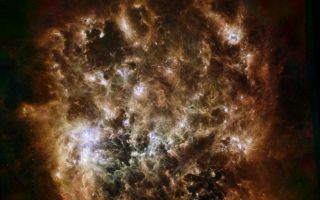 The brightest center-left region is called 30 Doradus, or the Tarantula Nebula, for its appearance in visible light. The image was taken Jan. 10, 2012.